In Upstate New York? 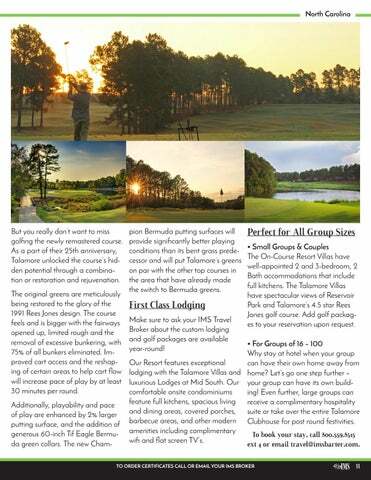 We have your Perfect Golf Day Itinerary ready for you on Page 5. 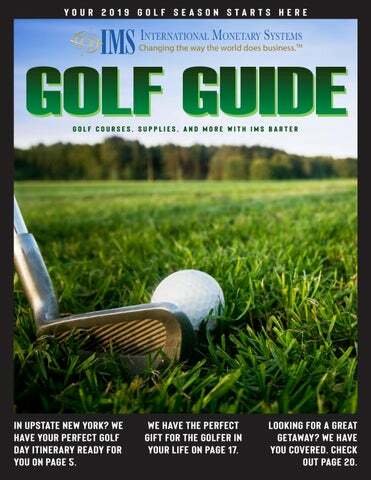 We have the perfect gift for the golfer in your life on page 17. Looking for a great getaway? We have you covered. Check out Page 20. • To book an accommodation listed in this guide, call the IMS Travel Department at 800-559-8515 ext 4 or email them at travel@imsbarter.com with the property name and the dates you are looking to book. 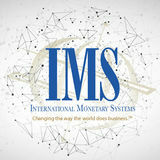 • To book an opportunity listed in this guide, contact your IMS Broker or call 800-559-8515 to be connected to an IMS Broker to help you with certificates and reservations. Set in a sweeping prairie looking towards the Rocky Mountains. Golf either 18 or 9, ride or walk! Conveniently located. Tee-times, carts and the range! Taking $MDS ONLY! TeeTimes after 1:00 p.m. only. Swim, Golf & Tennis Club. At last, an Affordable Country Club Membership: Southglenn Country Club is celebrating over 50 years of being the best value in a private, residential Country Club serving Centennial, Littleton and Highlands Ranch. The low-hassle, non-pretentious club environment encourages fun and camaraderie among members of all ages. Simply speaking, it’s easy to feel comfortable belonging here. We are truly a unique and innovative golf company. Our products are high quality and functional. Take a look at our must see website for products such as indoor golf roll out ranges, stance & turf simulators, driving nets, golf tees, blow up air targets, floating targets, putting greens and more. Birdie Ball is revolutionary, it is a totally new way to have golf fun and golf practice away from the golf course. It’s the best golf training aid invented this century. What’s so unique? It has a limited flight distance of 40 yards, but it feels and flies just like a real golf ball. It draws and it fades, but with a limited range so you can have your own backyard driving range. 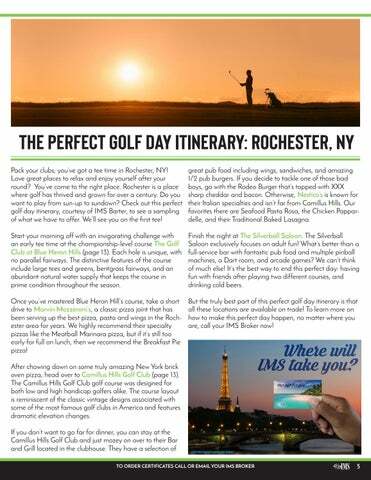 The Perfect Golf Day Itinerary: Rochester, NY Pack your clubs; you’ve got a tee time in Rochester, NY! Love great places to relax and enjoy yourself after your round? You’ve come to the right place. Rochester is a place where golf has thrived and grown for over a century. Do you want to play from sun-up to sundown? Check out this perfect golf day itinerary, courtesy of IMS Barter, to see a sampling of what we have to offer. We’ll see you on the first tee! Marengo Ridge Golf Course has been providing stress relief and enjoyment to Golfers since 1963. Come out as a foursome or benefit from a Season Pass for 2019. Enjoying friends, making new ones and maybe even doing a business deal in the process. What a way to spend a day. Call Bob Witek and ask him about the 2019 Season Passes for couple or families. You can also pick up foursome certificates from your IMS Broker to give your top clients. What better way to say thank you than giving them the joy of the outdoors? Call today 815-923-4336 for the Club House in Marengo or contact your IMS Broker directly for certificate information. Get them early, they are very popular! Wilderness Falls is Chicagoâ&#x20AC;&#x2122;s Most Exciting place for Family Fun! Play mini golf on top of a 40 foot waterfall, tip toe through Big Footâ&#x20AC;&#x2122;s cave, navigate the racing rapids, and most of all...have fun at Wilderness Falls! After golf, take a swing in the batting cages. Select baseball or softball, and choose from a variety of speeds. The cages are fun for all ages! Party Time! Have your next party at Wilderness Falls! Packages are affordable, and our party room is perfect for Birthdays, Team Trophy Parties, Church Groups, Scouts and more! Located just off Weber Road in Bolingbrook, Wilderness Falls is easy to get to. Improve your golf game with lessons from golf professional Trev Williams. He will personalize your golf instruction experience to be tailored to your skill level! From beginner to advanced, Trev will provide personalized lesson notes and Swing Video. Lessons are given indoors at Score 18 Indoor Golf at 1466 E. Chicago Avenue in Naperville. Contact Trev to set up your lessons today! When we say Hickory Sticks takes Kentucky golf to new heights we are not just talking about the spectacular views you’ll enjoy while playing our challenging course. You’ll find our course is the ideal place to hold your special occasion as our friendly staff takes hospitality to new heights. Come play or celebrate and we’ll take your day to new heights as well! Will take IMS Card for green fees. Built in 1989, Eagle Springs Golf Club offers an 18-hole championship course that is 6,583 yards and plays to Par 72 from the back tees, characterized by large by large greens, rolling terrain and bunkers situated so that they receive only very errant shots. Our 9-hole, Par 3 course is one of the finest in the St. Louis area, and plays to 1,270 yards and requires that players use most clubs in their bag. ADVANCED RESERVATIONS REQUIRED. 8 People Max per Tee Time. Whether you’re a beginner or a scratch golfer, you’re sure to enjoy your golf experience at Sugar Creek Golf Course. Our course is scenic, challenging, well-suited to golfers of all abilities and downright fun to play. That’s why so many St. Louis area golfers keep coming back to Sugar Creek Golf Course. We’re conveniently located in High Ridge, near Highway 30, just minutes from West County and South County. At Sugar Creek Golf Course, our courteous and professional staff has one goal - to make sure your golf experience is enjoyable. Please call ahead to reserve tee time. Club-Focused Instruction made golf simpler and progress more eminent. Players were relieved by simplicity and enthused by the results they experienced in their 3-day session at Heartland. Player’s responses range from a grin of satisfaction to a declaration of amazement. But instruction is not improvement. Having great instruction only informs our player what to do. Moving from instruction to execution requires one-on-one coaching and that’s exclusively what we provide by limiting our class size to just four players. Individual golf lessons, coaching and support located at Annbriar Golf Course in Waterloo, Illinois. (3) day school also available. Call today for details. BBQ grove located amidst our new outdoor pavilion with spacious seating, fireplaces and TV’s. Best In Golf Unique to Talamore Golf Resort are its exceptional onsite courses home to the Rees Jones-designed The New Course at Talamore and Pinehurst Magazine’s #1 Rated Private Course, the Arnold Palmer-designed Mid South Club. Along with our home courses, is the dizzying array of other famed Clubs we offer including Pine Needles, Mid Pines, Dormie Club, Tobacco Road, Legacy and so many more. pion Bermuda putting surfaces will provide significantly better playing conditions than its bent grass predecessor and will put Talamore’s greens on par with the other top courses in the area that have already made the switch to Bermuda greens. First Class Lodging Make sure to ask your IMS Travel Broker about the custom lodging and golf packages are available year-round! Perfect for All Group Sizes • Small Groups & Couples The On-Course Resort Villas have well-appointed 2 and 3-bedroom, 2 Bath accommodations that include full kitchens. The Talamore Villas have spectacular views of Reservoir Park and Talamore’s 4.5 star Rees Jones golf course. Add golf packages to your reservation upon request. • For Groups of 16 – 100 Why stay at hotel when your group Our Resort features exceptional can have their own home away from lodging with the Talamore Villas and home? Let’s go one step further – luxurious Lodges at Mid South. Our your group can have its own buildcomfortable onsite condominiums ing! Even further, large groups can feature full kitchens, spacious living receive a complimentary hospitality and dining areas, covered porches, suite or take over the entire Talamore barbecue areas, and other modern Clubhouse for post round festivities. amenities including complimentary To book your stay, call 800.559.8515 wifi and flat screen TV’s. ext 4 or email travel@imsbarter.com. Top Luxury Stays for Your Dream Golf Vacation Is your dream to book a high luxury golf vacation with top of the line accommodations and the perfect tee times at a top rate golf course? We can make that dream a reality. IMS Barter has properties that are the best of the best near some of the greatest courses. Here is our top twelve luxury stays for your dream golf vacation: 1.) Casa Caliente | Condo | Scottsdale, AZ | Course Near by: The Estancia Club Located in the Plaza Residences, this beautiful first floor condo is in a gated resort style community with swimming pools, health club, business center and spa. Only a few minutes’ walk to the upscale Kierland area of Scottsdale. This 2-bedroom/2-bath condo sleeps 4-6. Each bedroom has a queen bed and private bath and there is a pull-out sofa in the living room. 2.) Scottsdale Links Resort | Condo | Scottsdale, AZ | Course Near by: Whisper Rock Golf Club Scottsdale Links Resort showcases elegantly appointed accommodations with private patios that provide guests the ultimate in convenience and luxury complete with a steam room, fitness center, relaxing pool and spa-side areas. The resort is nestled between the TPC Desert golf course and the breathtaking McDowell Mountains. Spacious accommodation includes a well-appointed kitchen, separate dining room and a full bathroom with tub and shower. several of the finest championship golf courses in Florida. 6.) Grand Geneva Resort | Luxury Villa | Lake Geneva, WI | Course Near by: Grand Geneva (The Brute) Golf Resort You can get some rest and respite, have a romantic getaway, or enjoy a week’s vacation in a luxury villa surrounded by a score of amenities at the stunning Grand Geneva Resort and Spa® for only the cost of a suite at the resort. We offer two villas, a one bedroom deluxe (750 sq. ft.) and a smaller standard (500 sq. ft.), that provide the comforts of home complete with kitchen and king-sized bed. Our larger deluxe villa includes a fireplace to cozy up to and a Jacuzzi. Each villa sleeps 4. Two gorgeous one- bedroom villas that can be combined to sleep up to 8 adults. 10.) Bella Lago at Bay Beach | Condo | Ft. Myers Beach, FL | Course Near by: Fort Myers Country Club Luxury condominium just steps from beautiful sandy white beaches. This professionally Tommy Bahama decor decorated unit is located in an upscale Fort Myers Beach community at the southern end of the Island. Spacious interior with over 1950 square feet and 1300 square feet are hardwood floors. Upgraded maple cabinetry with corian counter tops and new GE profile appliances adorn this condo. Kitchen is completely turnkey furnished. 9.) Ft. Myers Oasis | Condo | Ft. Myers, FL | Course Near by: Streamsong Golf Resort 5.) Mountain Run At Boyne | Condo | Boyne Falls, Our Ft. Myers’ condo at Legends Golf and Country MI | Course Near by: Boyne Mountain Golf Course Club is sure to be the place to get away from life’s enThe resort itself is exactly what you might expect—fire- ergetic pace. Watch breathtaking sunrises and sunsets places and cozy décor and amenities, perfect after a on the lanai overseeing a small lake. Step outside and in seconds you will be poolside enjoying the balmy long day on the slopes, biking the mountain, playing golf or exploring the beautiful countryside. Chawater and watching nature’s beauty of palm trees, let-style architecture adds to the appeal. birds and vibrantly colorful flowers. The Camillus Hills Golf Club golf course was designed for both low and high handicap golfers alike. The course layout is reminiscent of the classic vintage designs associated with some of the most famous golf clubs in America and features dramatic elevation changes. In recent years, the course has evolved to accommodate modern day characteristics featuring drivable par 4’s and risk reward opportunities. These new features are now seen on the PGA tour today. It is truly a shot-makers course. Eighteen-hole public golf course. Driving range pass, golf cart pass. Tournaments considered. Excludes pro shop and lessons. Casual dining in an elegant atmosphere. Closed January, opening Easter Sunday. Contact your broker for Banquet referrals during this time. This is a semi private course offering golf to the public. Call ahead for tee times, as some slots are blocked out for members. Limited memberships available by referral only must contact Sabina at IMS Barter for more details. Enjoy playing a championship level course known for its unique golf architecture and impeccable course maintenance. Located just minutes east of Rochester, New York, Blue Heron will challenge even the best golfer. Must call ahead for tee times and mention IMS. Contact your broker for membership information. Portable Mini Golf- “ Putt it where you want to Putt it! “All rentals include the greens, clubs, balls, scorecards, pencils, delivery, set up and take down within a 30-mile radius of Buffalo Niagara International Airport. Call for availability and booking. Visit our website for pricing for portable mini golf and also game rentals. Offering golf lessons. Gary stresses the importance of understanding fundamentals and shot shape to instill confidence in playing the game. He combines the latest sports psychology, fitness, and course management training to help you achieve the highest-level performance you are capable. Offers lessons year-round. We are a Family owned and operated 18-hole, par 72 golf facility. Come here to relax and enjoy the day, just 25 minutes from most Columbus communities. Book a tee time ahead online thru our website or call. We accept the IMS card for rounds of golf also gift certificates available and yearly memberships, call IMS to purchase. New Era Golf owns six courses around Central Ohio, Glenross, Royal American, Bent Tree, New Albany Links, Clover Valley and The Golf Club of Dublin. IMS Members must purchase certificates for twosomes from IMS and must make tee times ahead. 9-hole course (previously known as the Golden Tee) in Springdale. Features 1207 yards of golf from the longest tees for a par of 27. The course rating is 35.0 & a slope rating of 113 on bent grass. Great driving range! Gift Certificates for 9 holes with cart. A challenging Michael Hurdzan designed course with 6 lakes, over 75 bunkers, and 5 sets of tees to challenge all skill levels. The golf course offers bentgrass tees, fairways and greens. Will take the IMS card, call ahead for tee time. Miniature Golfing, Magic Track Go-Karts, Kids Gym Playland, Laser Tag, Bumper Boats, Video Arcade and more! IMS card for attractions and games only. The Jack Kidwell design semi-private course in southwest Columbus features generous greens that are easy to hit balanced by challenging fairways. There are a number of water hazards lurking throughout and come into play on most of the holes. There are also a few strategically placed bunkers to watch out for. Greens are bent grass and fairways are bluegrass. Gift Certificate Only. MUST CALL in advance for Our championship 18-hole course layout showcases plush bent grass tee times and identify as IMS. tees, fairways, and greens that meFriendly Meadows Golf Course ander through breathtaking views of the countryside. Deep faced bunkers 809 State Rt 125, Hamersville, OH www.friendlymeadowsgolf.com and large greens are trademarks of the award-winning course designer Our 18-hole course provides a warm, Dr. Michael Hurdzan that are sure to welcoming atmosphere on some of challenge players of all skill level. We the most beautiful and picturesque accept the IMS card, must make tee terrain this country has to offer. Taking time ahead and show your IMS card advantage of its rural setting, our golf when you play. courses’ secluded, country setting offers a complete escape from the headaches Willow Run Golf Course of every-day life. Takes the IMS card, 1158 Hazelton Etna Rd SW, Pataskala, OH must call ahead for tee times. The Golf www.golfwillowrun.com Simulator is now available, call to make a reservation! 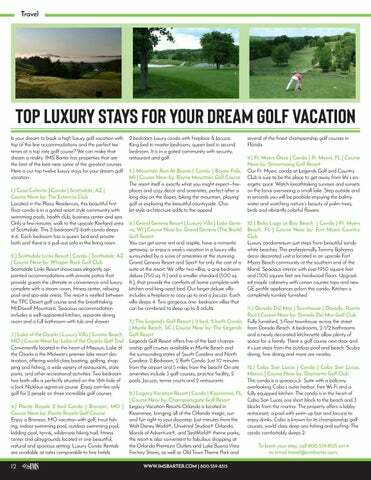 Ranked the “Best Public Golf Course” in Central Ohio by Columbus CEO Magazine. Beautiful par 72 golf course located across from the Columbus Zoo. We offer a practice facility too! Call for This Jack Kidwell designed course, built tee times. We accept the IMS card. in 1964 has bent grass greens and blue grass fairways with plenty of water and bunkers to challenge any golfer! Will take the IMS card for rounds of golf, also gift certificates available for $35.00 trade each (round of golf with cart). Must call ahead for tee time. Our idyllic settings will let you step away from life for a little while and focus on your golf passion. Our professionally engineered course will challenge you to improve your score on our fairways, water hazards and sand traps. 2-somes and 4-somes with cart for 18 holes available on Gift Certificate only. Come out and experience “AFFORDABLE GOLF” located three miles west of West Jefferson on Rt. 40. Par-71 with watered tees and fairways, watered bent grass greens, putting green and grass practice tee. Gift Certificate Only for 2-somes and 4-somes with cart for 18 holes. Sharpen your game and have fun on our state-of-the-art Golf Simulator. Call today to reserve your tee time! Manufacture and sales of portable putting greens. We also have 9- and 18-hole miniature golf courses that can be delivered and set up at your location to host your own golf event. A perfect addition to any party, family picnic, or event! Golf Simulator Room: Group of Four for one hour in Golf Simulator Room. We offer the most up-todate, state-of-the-art simulator featuring 66 US golf courses. This Bellefontaine Indoor Golf Club simulator gives you the ins and outs 1515 S Main St., Bellefontaine, OH of your swing from distance to angle www.bellefontainegolf.com and ball speed, ball spin, et cetera. Itâ&#x20AC;&#x2122;s here! The exact same golf technology used by leading sports retail outlets, elite It is located in a private setting with a relaxing atmosphere with food teaching academies and top ranked and drinks available and two teleuniversities all over the world; endorsed by the PGA TOUR and The Golf Chan- visions should there be any interest nel; is now in Bellefontaine! Bellefontaine in viewing a current televised event. Indoor Golf Club with over 70 courses, We offer professional golf instruc18 practice venues and more! Up to 4 tion. Contact your IMS Broker to people can play. Book your tee time in purchase gift certificates. Please call advance with your broker. ahead to reserve tee times. Come on a safari with us. Enjoy our beautiful indoor course where it is always glowing and a very pleasant 70 degrees. Under a spectacular umbrella of black lights, you will navigate through 18 exciting holes of mini-golf on your very own safari. Come play a round with a friend or schedule a party. We will arrange parties weekdays, Monday-Thursday. Accepts the IMS Card. We take pride in creating a custom putter that is both perfect in design and a gorgeous showpiece. Made from exotic woods from all over the world, we can inlay special memorabilia, such as coins or jewelry, or add personalized messages or company logos. Our putters also are designed to improve your game. Built into every putter are features meant to eliminate or minimize putting mistakes. Our putters will help you develop consistency in your putting stroke. The high-quality craftsmanship makes an Ember putter the perfect gift for any occasion. The Virtues is a spectacular Arthur Hills-designed championship golf course. Open to the public, we are #65 on The Golf Digest top 100 golf rankings, the only top 100 ranked public golf course in Ohio. We are located just 40 miles from downtown Columbus, Ohio. Contact your trade broker for gift certificates. Gift certificates only. Formerly Longaberger Gold Club, just east of Newark, OH. Amid the rolling hills, you will find one of Southwest Ohioâ&#x20AC;&#x2122;s top-ranked golfing experiences at Beckett Ridge Country Club. We have a classic 18-hole course with majestic trees and wandering streams. Accepts the IMS card. Also, gift cards are available too, call IMS to purchase. Call ahead for tee times. Voted BEST Mid-Cape Resort Hotel by Cape Cod Life Magazine; the Bayside Resort Hotel offers all non-smoking guest rooms that feature cable television, free wireless internet access, and a small refrigerator. We also have 20 golf courses located within 20 minutes! Many of the rooms have sundecks, cathedral ceiling and views of Lewis Bay. Located close to beaches, restaurants, shopping and Cape Cod attractions. Enjoy 20 golf courses within 20 minutes of Bayside Resort. Just a short drive to ferries for both Nantucket and Martha’s Vineyard. Set in the heart of the 2,000-acre Giants Ridge Recreation Area, owners at The Residence Club will enjoy what is arguably Minnesota’s finest four-season vacation spot. Beautiful lakes for swimming and boating, two nationally recognized golf courses, downhill and cross-country skiing, hiking and biking trails and much more…all at your doorstep. The perfect place to create and preserve those cherished family memories. Horicon Hills Golf Club, formerly Rock River Hills GC, is a public course built along the Rock River with 13 of the 18 holes involving water. Horicon Hills is considered one of the best kept secrets in Southern Wisconsin golf. It is a very picturesque course with an abundance of wildlife roaming its terrain. Beautiful golf course just west of Waukesha on Hwy 59 between Eagle and Genesee. Accepts multiple dining scrip Monday - Thursday anytime; Saturdays, Sundays, and holidays after 2:00pm. Join us for a fun round of golf! Championship style, 18-hole course, 15 minutes north of the Milwaukee area. This is a shot makerâ&#x20AC;&#x2122;s paradise, with pristine fairways, challenging greens, and water. Use the IMS MDS to book golf or order 18-hole certs from your broker. IMS also stocks gift certificates for 18 holes with cart which makes for a great gift item. Browns Lake Golf Courseâ&#x20AC;&#x2122;s manicured fairways and contoured greens stretch for 6,449 challenging yards. Opened in 1921 the course has had 90 years to mature and provides a memorable experience for all players. Make your tee time today. Visit a beautiful golf course just off of Hwy 33 in West Bend. Water comes into play on 16 of the 18 holes along with the challenging fairways. MDS is accepted anytime for golf, restaurants, and carts. Call to book your time and come see what everybody is talking about! Premier 18 Hole Championship Golf course located in the Lake Country area. Our golf course features a full-service pro shop with an on-site golf pro, practice range, bunker and green, golf carts. Call your IMS broker to order these specific gift certs for 18 hole and cart. We accept the $10 MDS IMS Scrip Certificates. A beautiful 18-hole golf course south of I-94 on Hwy 67. Come see the rolling hills and incredible landscaping on our course. Multiple dining scrip Mon.-Thur. anytime, Fri.-Sun. and holidays after 2 pm. The first Jack Nicklaus Signature design in the state. A great test for all skill levels. Order these specific certificates from your broker. Corporate and single memberships also available. Enjoy our challenging 18-hole mini golf course, or work on your game at our full size driving range. We accept the standard $10 MDS Scrip for our golfing services on site. Mini-Golf at its finest! We have 5 different courses with 91 unique holes in all. Welcome to Gastrau’s Golf Center! Since 1998, Gastrau’s has been serving It’s beautiful here too - we are not your southeastern Wisconsin providing qual- normal mini-golf, and we’re consistently ranked as one of the best things to do ity service to the first-time golfer and in Wisconsin Dells by our own customthe seasoned veteran. Whether you’re looking for family fun at adventure golf, ers. Put your putting skills to the test in a fun-filled setting of natural wonders inand footgolf, or a serious golfer lookcluding cascading waterfalls, mountaining for new clubs and serious practice, Gastrau’s will be able to accommodate ous terrain, sandstone rock formations, footbridges, lavish landscaping and your needs! pirate’s lore. Call to get your admission certificates now! Looking to improve your game? Half Hour PGA Golf instruction available by Mark Braska - PGA Professional! Portage Golf Club can be one of the most interesting and eclectic courses you’ll play, as well as possibly one of the toughest. With abundant wildlife, ponds and Swan Lake looking as if they were drawn in by an artist, this is a course you’ll tell your friends about, though you may not tell them your score. Call today to Schedule your appointment. Offering golf supplies: Custom Carry Towels, Custom Plush Pile Fur Shoe Bags, in a variety of colors, Custom Gold Headcovers. All items can be embroidered with your logo. Call today to place order. STYLE #5052 $8 with Logo | 12 pc minimum order | $75 set up free for embroidery logo Plush pile fur shoe bag. Features a sewn-in divider and a drawstring/latch closure to keep shoes safely in place. Fits up to size 13 shoe. Dimensions are 15”x 14.” Price includes logos embroidered up to 10,000 stitches. Logo needs to fit within 4” diameter circle. Available in hunter green, navy, and black. $12 with Logo | 12 pc minimum order | $75 set up free for embroidery logo Synthetic suede/fur headcover. Large embroidery area and 18” overall length makes this great for protecting expensive shafts. Comes with #1 tag. Fits 460CC drivers, Price includes logo embroidered up to 10,000 stitches. Logo can be up to 2.75” wide and 5.5” tall. Available in green/black only. Contoured fur headcover with acrylic stretch material on back to allow for snug fitting headcovers. Interchangeable number tags. Comes with #1 tag. Fits 460CC drivers. Price includes logo embroidered up to 10,000 stitches. Logo needs to fit within 3.75” diameter circle. Available in tan/black only. Located 30 Minutes South of Milwaukee, Ives Grove Golf Links offers 27 holes of premium golf. Designed as a links-style course, players encounter 110 bunkers, nature areas and rolling greens. With outstanding practice facilities, fully stocked pro shop and an experienced golf shop staff, we will be able to put you at ease as you prepare for your round. Call today to book your tee time. Bridges Golf Course is open to the public. We have 18 championship holes, driving range, practice bunker and 2 practice putting and chipping greens. Our company is based on the belief that our customers’ needs are of the utmost importance. Our entire team is committed to meeting those needs. As a result, a high percentage of our business is from repeat customers and referrals. We welcome the opportunity to earn your trust and deliver you the best service. Order these Specific Gift Certs from your IMS Broker for 18-hole golf passes. Breathtaking golf course just outside of Sussex, WI. The well-designed course combines the excitement of challenging golf with SE Wisconsin’s natural beauty. When you tee off at Coachman’s, you are greeted by 27 holes of gently sloping hills lined with oaks and willows. You’ll find water hazards and roughs that can drive anyone to their knees, yet Coachman’s is open enough for beginners to keep up. Our red, white and blue courses ensure that anyone, from a 25 handicap to a scratch golfer is sure to have a great time. While the Johnson family ponders improvements, the staff at Coachman’s will continue to offer unlimited golf with delicious American cuisine, you might say it’s the total golf package. Offering 18-hole rounds of golf for $50 for IMS members. Cherokee’s beautiful 18-hole course weaves through protected wetlands for a peaceful and secluded golf experience. Cherokee offers a unique 11 course yardage design that can be played from 1900 yards to 7500 yards. Each course has its own slope and rating. Members enjoy great accessibility, fast pace of play, and course conditions that are kept to PGA tour standards. Please call to make a tee time and mention you are an IMS member. Please remember that the dress code is strictly enforced. Memberships also available on trade. Call for more information. The “New” and “Old” nines have finally matured into a seamless 18 hole experience that will offer you a most enjoyable challenge. Our tree lined fairways reward the tee shot that finds the fairway. While measuring a seemingly short 6,544 from the Championship tee, this course demands excellence at every turn. Club selection is of extreme importance as elevation changes and swirling winds abound. Draper Creek meanders throughout the golf course connecting Devil’s Lake to the Baraboo River, creating challenging water features on nine out of 18 championship caliber holes. Call for available gift certificates. Nike Putters, New Right/ Left handed putters available with head covers included. Also available in 33, 34, & 35-inch lengths. Also have different sets of Top Flite golf balls. Contact Art Benson to place orders and for more of what golf supplies are available. This 9-hole course will challenge the talent and character of players of all skill levels. Driving range also on premise. Accepts MDS for greens fee and also driving range usage. Spring Brook’s golf course features a stunning layout amidst the tall pines of the Wisconsin Northwoods. Its 9-hole layout is a par-36 regulation course that offers a fair test of golf for a variety of golf abilities. Gift Certificates available. We invite you to “Play the Canyon” at Cold Water Canyon Golf Course, located at Chula Vista Resort – one of Wisconsin’s most historic golf courses. 18 challenging holes await you on a course that boasts a traditional style front nine that was built in 1923. The exciting new back nine features link-style hills, moguls and bunkers that create secluded fairways that will enhance your golf experience. Order certificates from your broker. Bomber’s Golf Course is a beautifully maintained U.S.G.A. 9-hole course at with gentle rolling hills set alongside 4000 feet of the Menominee river frontage. Reservations required. We are one of the most picturesque courses around. The best kept secret in southern Wisconsin. Built in 1924, we offer four levels of play from the junior level to the masters of the sport. Join us for the history, join us for the golf. When we say Koshkonong Mounds Country Club takes Wisconsin golf to new heights, we are not just talking about the spectacular views you'll enjoy while playing our challenging championship course. You'll find our clubhouse to be the height of elegance and the ideal place to hold your special event as our award-winning staff caters to your every need. Come golf, dine and celebrate! Our 18-hole course offers beautiful terrain with over 3000 trees, 41 sand traps and many other cosmetic enhancements. Enjoy a nice walk in the park! Muskego Lakes features four sets of tees measuring 6600 yards from the back tees. Muskego Lakes is known for the smoothest greens in the area with a layout that does not put a premium on length so much as shot placement (due to having 8 doglegs). If you want to play on short cut fairways and tees while challenging your accuracy, Muskego Lakes is for you. Reservation required. Accepting MDS for regular play. Fore MKE features four high tech indoor simulators and a full open bar with extended late-night hours. The perfect place for a team building or group outing. Our pub lounge area features a complete bar with an extensive menu of beer, wine and specialty cocktails. Come join us to watch your favorite sporting event and to enjoy a beverage while you and your friends play a championship course! You can also practice and hone your skills. Our simulators feature 34 world famous championship golf courses and an interactive practice facility. The simulators offer multiple practice options such as driving, chipping, and shot accuracy at varying distances. Track your shot length, distance from the target, trajectory, swing speed and many other metrics. The shot tracer shows the entire flight of the ball just like you see on TV golf broadcasts. Ask about our special Green Bay Packers and Badgers Parties. Reservations usually required. • 65% of corporations listed in the NY Stock Exchange are involved in bartering. Is your dream to book a high luxury golf vacation with top of the line accommodations and the perfect tee times at a top rate golf course? We can make that dream a reality. IMS Barter has properties that are the best of the best near some of the greatest courses. Check out our top twelve luxury stays for your dream golf vacation! Make this your destination golf experience for 2019! 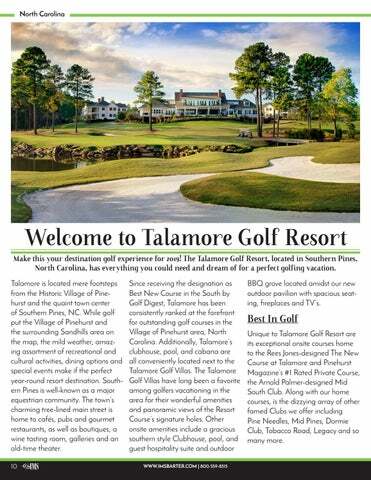 The Talamore Golf Resort, located in Southern Pines, North Carolina, has everything you could need and dream of for a perfect golfing vacation. Looking to set up the perfect day in Rochester, NY? Good, because we have the perfect day already planned for you! From where to golf to where to eat, we have it ready for you.